Herbivores and mycorrhizal fungi commonly occur together on host plants and thus are likely to interact in ways that could indirectly affect each other’s performance. In this chapter, we review the published studies on these interactions and their implications for plant, herbivore and fungal populations and communities. Six major patterns emerge from our review. First, in the majority of cases, aboveground herbivores reduce mycorrhizal colonization and alter mycorrhizal fungal community composition. Second, mycorrhizae also affect herbivores, but these effects are highly variable and range from positive to negative. Third, both of these interactions are conditional. For example, mycorrhizae are more likely to be affected by herbivores as the herbivory and/or the cumulative effects of environmental stress intensify. Under relatively benign conditions, herbivory may have no effect on mycorrhizae, but as plants are challenged, the impacts of herbivores on mycorrhizae can be great. 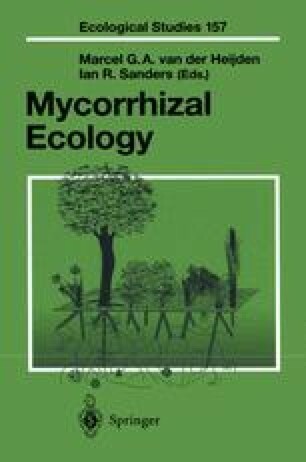 Fourth, all mycorrhizae are not equal; the impacts of mycorrhizae on herbivores differ greatly between arbuscular mycorrhizal (AM) and ecto-mycorrhizal (EM) fungi and among species. Because different mycorrhizal species vary in their mutualistic effects on plants, such variation in impacts on herbivores should also be expected. Fifth, different types of herbivores are affected differently by mycorrhizae. Generalist herbivores appear to be affected more than specialists, and leaf chewers are more likely to be negatively affected, while sap feeders and their allies are more likely to be positively affected. Sixth, few studies have examined mycorrhizal effects on herbivores and herbivore effects on mycorrhizae in the same system. However, if interactions between aboveground herbivores and mycorrhizal fungi are similar to those observed between above- and belowground herbivores, they are likely to be highly asymmetrical with aboveground herbivores having greater negative effects on mycorrhizae than vice versa.